Ian Scott Smith, who crossed 24 times for Scotland in the Five Nations between 1924 and 1933, was born in Melbourne, Australia, on October 31, 1903. He came to Britain as a youngster and attended Cargilfield preparatory school in Edinburgh before entering Winchester College, a school with a tradition for soccer rather than rugby. From Winchester he progressed to Brasenose College, Oxford, winning a rugby Blue in the University match of December 1923, when Phil Macpherson captained the Dark Blues to victory. Young Smith, running fast and straight scored two of their tries. His speed and dash made him a formidable opponent and he could kick long and straight. Both his parents were Scottish and during his Oxford days he made it perfectly clear that there was no Sassenach, nor even Welsh blood in his veins. And so, shortly after his blazing start on the Oxford flanks he was drafted in to appear in a Scottish trial. 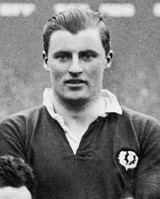 He was not immediately selected for the opening international match of the season, Scotland's journey to Paris to meet France, but after the visitors were beaten 12-10 in the French capital on New Year's Day 1924, he was brought in to add pace to the Scottish attack for the home fixture at Inverleith with Wales the month later. The Welsh were overwhelmed and Smith, with a hat-trick of tries, helped the Scots establish an unassailable 35-point lead before Wales managed two consolation converted tries in the last six minutes of the match. Scotland's threequarter line that day comprised Oxford students: Phil Macpherson, George Aitken (a former All Black Test centre) and Johnnie Wallace (an Australian) joining Smith in what remains Scotland's highest score and biggest winning margin against Wales. One of the visiting Welsh threequarters made a point of asking to be introduced to Smith after the match. He had only seen the back of him during the game and wanted to make sure he recognised him if they ever met again. The year 1925 was to be Scotland's annus mirabilis, the Scots winning their first Grand Slam, but the season had an inauspicious beginning for Ian Smith. He lost his place in the Oxford side and missed their big games against the touring All Blacks and Cambridge. He was still at the front of the Scottish selectors' minds, however, and after crossing for five tries in the final Trial kept his international place for a season that began with a 25-4 win against France at Inverleith. There was a total eclipse of the sun that afternoon, and on the field Smith was responsible for eclipsing the French, scoring four of Scotland's seven tries. At the post-match banquet, an admiring Frenchman struck up a conversation with the prolific try-scorer and asked him what he'd clocked on the track for the 100 metres. Something must have got lost in translation, for Smith, believing he had been asked how many tries he'd scored, nonchalantly replied, "Four or five." The poor Frenchman was speechless. No wonder Smith was known as the Flying Scotsman. A fortnight later he scored another four Test tries, this time against the Welsh at Swansea. Uniquely that scoring sequence included six successive Five Nations tries - back-to back hat-tricks that included the last three tries of the French match and the first three of the Welsh game. For most of his long career Smith had Phil Macpherson as his centre. Macpherson was not just an unselfish player with the rare gift of excellent judgement. As a captain, he proved to be a clever tactician with the authority to bring out the best in his teams. Unquestionably Smith - and Scotland - benefited from Macpherson's genius, particularly in the Grand Slam matches of 1925 when the pair formed Scotland's left wing. Macpherson was absent in 1926, studying at an American university, but Smith remained an integral part of the Scottish fifteen that retained the Championship. Smith's two tries against England at the end of the season helped Scotland become the first Home Union to win at Twickenham since the opening of the ground in 1910. Many are the tales told of his escapades, especially during his rugby career. After Scotland's 20-6 Paris win in January 1926, he and Johnnie Wallace, who had just graduated in Law and was about to return home to Australia, decided to take a trip to Switzerland to celebrate Wallace's last match, believing it to be a short train ride from the French capital. They spent a fortune buying tickets to Davos and eventually booked in to a plush hotel where a friend was staying. They had no money left and relied on the friend for board and sustenance. Next day, they decided to "do" the Parsenn Run, undaunted by the fact that neither of them had ever skied before. Experts reckon it takes a seasoned skier 25 minutes. Wallace and Smith endured nine hours of danger, pain and grief. But for their bravery they were richly rewarded - wined, dined and entertained by the admiring denizens of Davos at no cost to themselves. The next season, when Smith and Macpherson were reunited, Scotland headed the Championship table once again, losing only to Ireland in a game played in appalling conditions in Dublin. Earlier that season, against France at Murrayfield, Smith had damaged a foot on an iron railing shortly before the match but, reinforced by a couple of pain-killing brandies, he nevertheless took the field. The analgesic was most effective. Smith scored early in the match, running-in from his own half, and added a second before the interval. Two more tries, against England in March, brought his tally to 17 from just 14 Tests - a remarkable strike-rate that pulled him into second place on the Test try-scoring roster, one try behind the then record holder, Cyril "Kid" Lowe, the celebrated England wing who had retired in 1923. In his day it was the custom for wing threequarters to throw the ball into the line-out. (Hookers weren't deemed capable of the task until the 1970s). His under-arm action, lobbing the ball high into the air, was always judged to perfection and an important source of possession for the successful Scotland sides in which he played. As a try-scorer, he had a particular penchant for running on to diagonal cross-field punts, often waiting for the bounce before outstripping opponents to gather the ball as it rolled at speed towards the goal-line. Smith had a high knee action which made him difficult to tackle when running at full speed. The Flying Scotsman was out of commission in 1928 but on his return to Test rugby the year later he scored a try against Ireland and surpassed Lowe's record by scoring the two winning tries of the Calcutta Cup match. Playing the "Auld Enemy" was a particular pleasure and he crossed for two more against England in 1931 and another the year later, at Twickenham. In 1933, in his last season as a Test player, he was rewarded with the Scotland captaincy and led them to the Triple Crown. Fittingly at Swansea in one of Scotland's rare victories on Welsh soil the skipper contributed to a memorable win with the opening score of the match. It was his 24th and last try in Tests for, after leading the side to wins over England and Ireland (in a postponed match on April 1) he announced his retirement. The side had actually been stranded at sea on its way to the Dublin match originally scheduled for February of that year. So severe was the weather that radio contact with the ship carrying the team was lost and prayers for the safety of the entire Scottish travelling party were offered at Sunday services throughout Ireland and Scotland that weekend. His long career was remarkable for his prowess as a try-scorer and surrounded by enjoyment and fun. On his first Barbarian tour to South Wales he scored tries in close matches against Cardiff and Swansea. Indeed, his try in the Swansea game typified his love of adventure on the field, for it was the climax of a thrilling move he had started from near his own goal-line. Off the pitch he was invariably the life and soul of the party and in one late night escapade after a Calcutta Cup match was reported as having driven a car filled with elated team-mates along Edinburgh's Princes Street … on the pavement, horn blowing and headlights glaring. By profession he had qualified as a chartered accountant at Edinburgh University, but after World War Two service in the RAOC he practised law, becoming a solicitor in Edinburgh until ill-health compelled him to retire in 1964. He later lost a leg through illness, but his enjoyment of the game he had adorned so brilliantly in his youth never waned. He retained the cheerfulness of his youth and even managed to contrive to continue his sporting passions for shooting and fishing - the River Tweed flowing past the bottom of his Kelso garden where he and his wife kept an open house for friends and former players. When he died in September 1972, many tributes were paid to a man who was described as one of sport's finest Corinthians, though few then could have foreseen that his wonderful try-scoring record in the International Championship would stand for nearly forty years after his death.